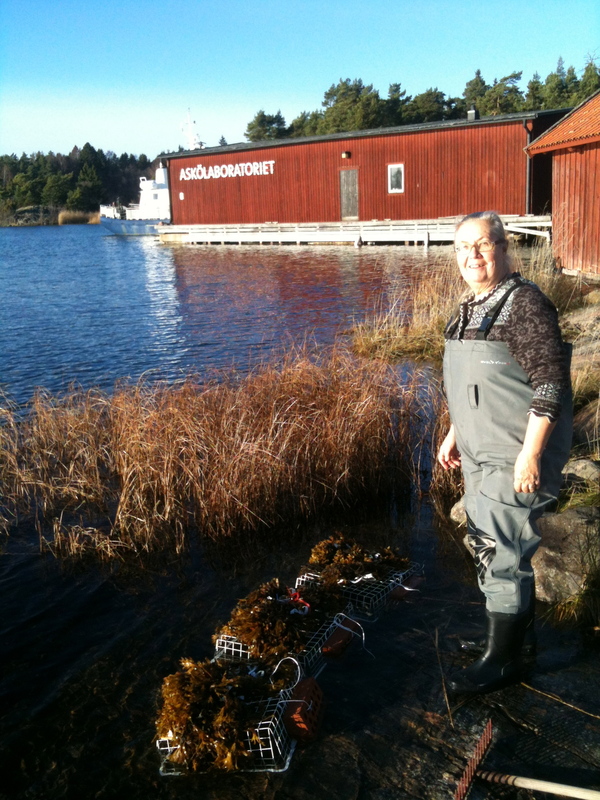 Last Monday it was time to put the seaweed out in the sea for overwintering. After some different trials of overwintering indoors in the Experiment Hall at the Askö Laboratory, with extra lights and air pumps, we have found that it is still difficult to get good enough water circulation and movement for the seaweed to be happy. It becomes brittle and falls apart come spring. But tying plants on to net cages and placing them on the sea floor at some meters depth works just fine! The weather was amazing. Calm and brilliant sun. But the water level was too high, so now they are places too shallow to remain in the bay all winter. We will have to come back later and move them to a deeper waters. That will be a dry suit -job. 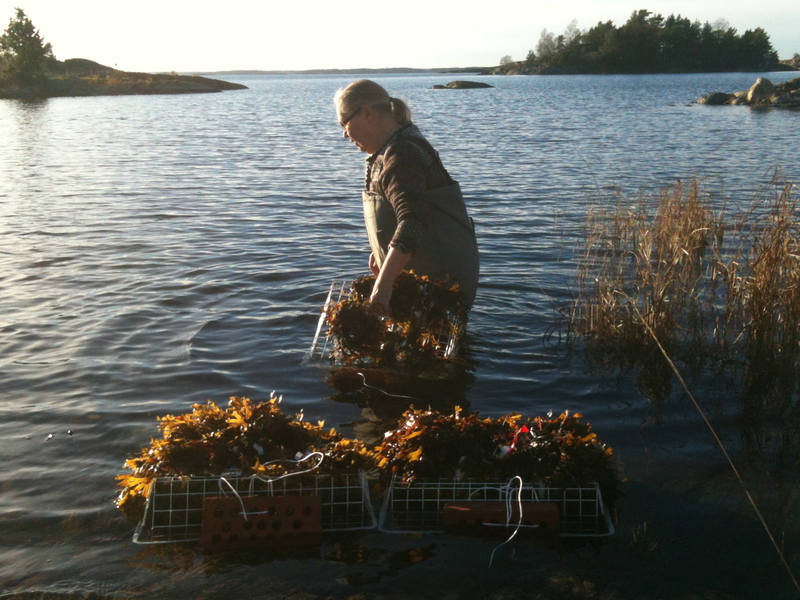 In this year’s seaweed plantation is material from Gotland that we have collected in order to try and solve the question of if there is a third ecotype of bladderwrack. We know from before that in the Baltic Sea we find both summer reproducing (end of May-June) and autumn reproducing (end July-October) bladderwrack. But now it seems that we have found a third type, that reproduces more or less constantly throughout the entire season (May-October). The Sea Environment Seminar of 2013, was held at Vår Gård located in Saltsjöbaden outside Stockholm. In the morning Lena went for a walk alongthe beach and found plenty of free-floating bladderwrack balls, both in the wrack wall on the beach and also floating in the shallow water, rolling around. According to litterature, these do not reproduce sexually, and we have never seen any reproductive tips on this form of bladderwrack. Naturally, she collected several wrackballs. Since Lena had forgotten to bring a plastic bag (wich is something a true marine biologist always should keep on her/him), she had to go back to the hotel reception and ask for one. Imagine their surprised looks. The day after, Lena went out to ASkö and tied the wrackballs to little ceramic tiles. What we are looking for is if these freee floating forms will become sexual in spring if they have a fixed up and down. Now they are placed in the sea for the winter, and all we can do is wait for the return of sunlight and warmth in spring, when we can dive down and check if there are any reproductive tips on them. 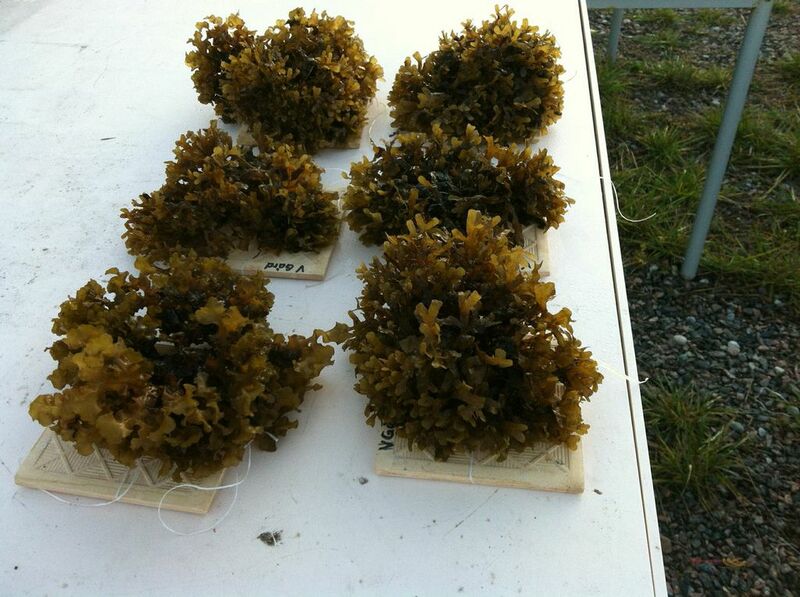 This entry was posted in News and tagged Askö Marine Laboratory, Baltic Sea, bladderwrack, dry suit, experiment, fieldwork, Fucus, Fucus vesiculosus, Lena Kautsky, macroalgae, marine biology, seaweed, wrack. Bookmark the permalink. I am all ears to know if there came any reproductive tips on the bladderwrack balls? Last season there were none. I hope to check them in mid-May and see if anything has happened. Stay tuned for the (possible) exciting follow-up.